Mr Ao was arrested at a Jacky Cheun in China. 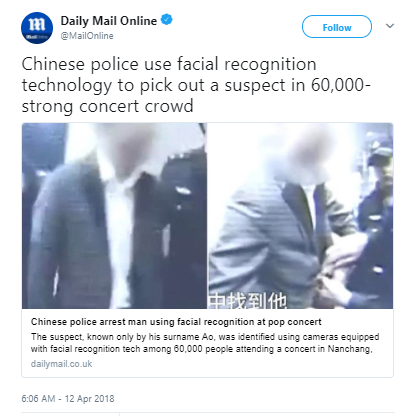 Chinese police were able to catch a fugitive at a concert in Nanchang, Jiangxi province, with roughly 60,000 concertgoers by using facial recognition technology. A man, identified as “Mr. Ao,” was arrested last week at a concert with Hong Kong singer Jacky Cheun after having driven 60 miles to the concert with his wife and friends, the Telegraph reported. Mr. Ao was wanted for an “economic dispute” in the Guangxi province. Not long after the music started, the suspect was approached by several police officers and arrested. Mr. Ao was shocked upon his arrest, Li added. Facial recognition technology is widespread in China, as the country has been pushing for such systems to be used for law enforcement purposes. The technology is being used to monitor individuals at public events, airports and other large public areas. Last month, 33 people were detained by police at a train station due to police wearing facial recognition sunglasses capable of identifying people in larger crowds. The images are sent to a database that identifies them and checks their personal information.